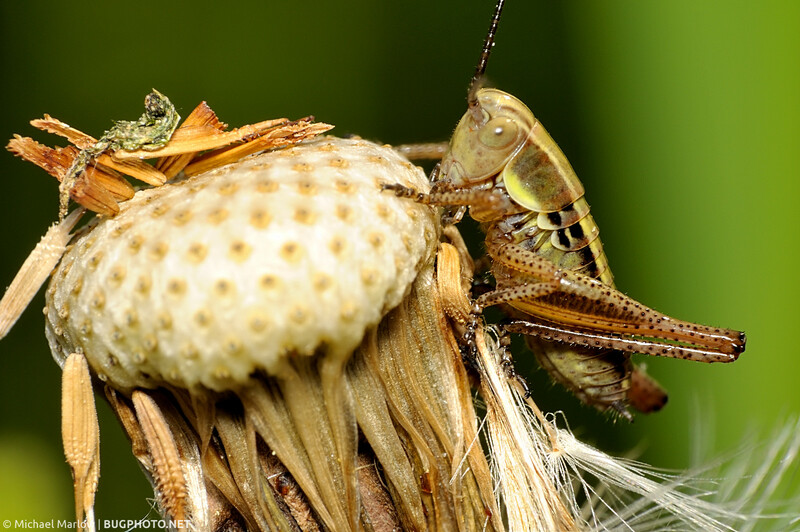 This wary Roesel’s Katydid nymph quickly began to reconsider its choice of a dead flower perch when I came along. So I tried something a little different to battle a partially overexposed shot. After making basic adjustments in contrast, saturation, etc., I jumped into GIMP and created a duplicate a duplicate layer on my katydid image and applied the Multiply blend mode. Now if you’ve read my posts earlier in the week, you’re saying, That’s what you did before, Skippy. Which is true. The difference this time was that I also created a layer mask, initialized to black/full transparency. The reason I did this was because I was worried about the color transitions; I didn’t want the original exposure to suddenly turn to a darker shade. The transparent layer mask allowed me to hide the parts of the image I wanted to keep the same and reveal the overexposed, glaring areas. First I selected the overexposedarea, then I used the Blend tool, with a FG to BG gradient (white to black) and Radial shape, to create a gradient which served to fully reveal the effect of the Multiply layer at the center before transitioning to fully hidden at the edges of the selection. It worked fairly well, but since I wasn’t using a perfectly circular selection, the gradient was not uniform around the whole selection. If I was more regimented, I likely could have worked around this issue, but it wasn’t very noticeable so I didn’t worry about it. I did have one small problem: there was a thin line running along the edge of the selection. I can’t really account for it; as far as I can tell, the gradient should have left a seamlessly, fully transparent, and thus “invisible” border between the selection and the image at large. It didn’t work out that way, and so I had to resort to some tedious work with the Healtool. On a different note, I just wanted to say I was pretty thrilled to get an identification on this little baby. With the help of Piotr Naskrecki’s amazing site, The Smaller Majority, and then BugGuide.net (of course) I was able to pin it down as an (unfortunately) invasive species, Metrioptera roeselii, or Roesel’s Katydid. When I originally took the shot, I had thought it was a cricket, then later on I had determined it was a katydid, but as I was preparing this post I thought it might be a grasshopper. Well, before I gave myself a concussion banging on the ID wall, I broke through by relying on Piotr who is an expert in these Orthopterans (which is not me at all) and also happens to live in Massachusetts (now that’s me). Posted in KatydidsTagged gimp, layer mask, Metrioptera roeselii, overexposed, Roesel's Katydid, TettigoniidaeBookmark the permalink.